Every small business can utilize a one-page, simple calendar to highlight paydays, quarterly notes, and more. 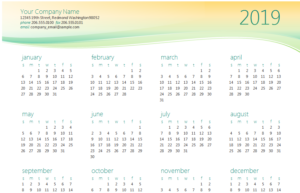 This 2019 Excel calendar is an easy, printable 12-month display of the year that you can customize for your business. Download the Excel calendar and open it. The year is pre-set to 2019 but it can be set to 2019, 2020, 2021, or any year you need. To do this, use the arrows to the right to change the year. The calendar will automatically adjust itself to match those dates. Next, edit the top left corner of the calendar. Enter your company’s name, phone number, fax, and general email address. Then move to the bottom where there is placeholder text to enter your company slogan or tagline. You can erase this if your company doesn’t have one. From here, use the Excel highlight or text color tool to make any dates you want to stand out. You can do the whole date ranges for important assignments, paydays, or anything specific to your department. Once you’ve finished, print the calendar and display it in a visible place. Make different copies for each department. HR could have payroll dates highlighted, and marketing could have the busiest holiday weeks bolded. Print multiple copies and have any new hires take one to keep with them.